Heat oven to 350°F. Line cookie sheet with parchment paper. In large bowl, mix granulated sugar, flour and ground cinnamon; stir in apple. Unroll 1 pie crust on lightly floured surface. With rolling pin, roll out crust until 12 inches in diameter. Press pie mold on crust forming 4 dough rounds. Turn mold over; place 1 dough round into one side of mold, pushing down gently to fill mold, making sure dough is stretched to edge of mold. Spoon 1/4 cup apple mixture onto center of dough round. Place 5 cinnamon candies evenly over apple mixture. Lightly brush egg on edge of dough round. Place second dough round with air vent on top of filling, making sure scalloped edges match. Close mold; press to crimp and seal pie. With table knife and using light pressure, trace apple shape onto pie. 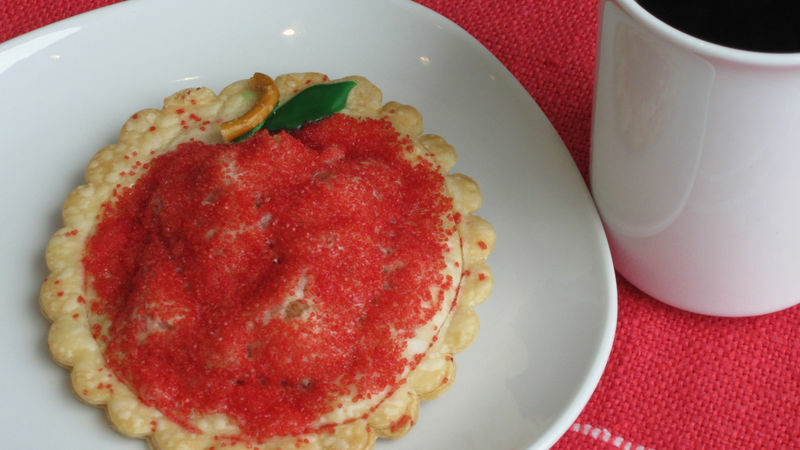 Lightly brush beaten egg over apple design on crust; sprinkle 1 teaspoon red sugar over top. With fork, prick top of crust in 2 places to allow steam to escape during baking. Carefully remove pie from mold; place on cookie sheet. Repeat with remaining pie crust and filling to make 3 more pies. Bake 20 to 25 minutes or until crust is golden brown. Cool 20 minutes. For each pie, pipe small strip of green icing on pretzel stick; press down on stem portion of apple. Use green icing to pipe leaf shape on right side of stem. For Apple-Cranberry Pies, substitute sweetened dried cranberries for the cinnamon candies; omit the red sugar and other decorations. Tovolo makes other petite pie mold designs, including pumpkin, star, heart, pear and strawberry.